How would you paint me? If you were a artist how would you paint me? With deep solid strokes or your brush sweeping softly? Would you paint me by number, quickly fill In the lines or sketch me first, taking your time? Would you use vibrant colors or plain shades of gray? Would you change me in any way? 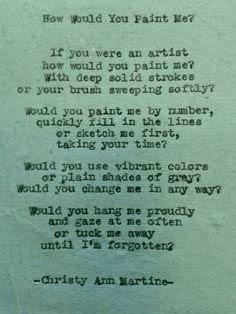 Would you hang me proudly and gaze at me often or tuck me away until I'm forgotten? Painting is one of the finest arts that has produced great painters like Michael Angelo, Leonardo Da Vinci, and Pablo Picasso. Painting is the art of the heart and not the hands. Picasso rightly said “painting is a blind man’s profession. He paints not what he sees but what he feels, what he tells himself about what he has seen”. It needs great skill and the heart filled with emotions to understand a painting and try to catch what the painter intends to convey. Such is the wave length exhibited by an work of paint. It is not only a combination of color and strokes but a combination of emotions, feeling and views that an artist is trying to convey. A good painting stands against the test of time and is immortal. 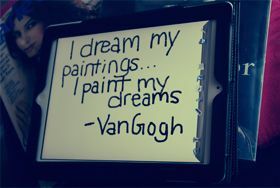 Here are quotes on painting which can be described as a silent poetry.